Dancing is one of the world’s oldest and most adored activities. There are numerous dances and all have there own styles and history. This is why dance classes have always been a popular choice amongst the young and old and thousands of people join up to a variety of dance classes every year. However, entering a dance class is sometimes quite an intimidating experience. Depending on the dance or the level of dance experience of the group, a dance class can be quite an overwhelming atmosphere to enter. Many people are passionate about dancing but refuse to participate or attend a dance class because of nerves, anxiety and fear of embarrassment. Dance instructors will apply some easy ice breaker games to a class so that everybody feels welcome, relaxed and comfortable. The idea is to ensure that everyone in the group is confident and enthusiastic about the routine of dance steps they are learning. Ice breaker games are excellent for this as they help individuals become acquainted with the style of dance, the tempo of the class and to get everyone comfortable with one another. This is an alteration of musical statues but works incredibly well for dance classes. This is a simple ice breaker game that can be used for all ages. 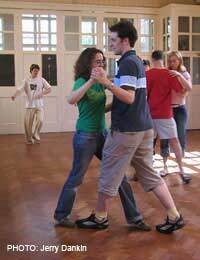 Firstly, go through a set of dance steps or stances and explain that the music will begin and the class must dance. When the music stops the group should drop into one of the dance steps or stances you have taught them. This is a great way of getting a group to remember tricky steps or dance positions. A classic ice breaker game that is perfect for the dance class. Simon Says Dance is simply the original game but using dance steps, stances and positions. Ensure the group is clear about the steps, stances or positions that will be used and clearly explain that if someone performs a position etc when you haven’t said Simon Says they will be out. As with Dance Freeze, this ice breaker game helps the group pick up steps and positions quickly while enjoying a fun game. This ice breaker game is a real confidence booster and eliminates the anxiety of dancing in front of others. Ask the group to spread out and form a circle, then play a variety of music and let each person enter the circle and either freestyle dance or perform a few dance steps or moves. This ice breaker game allows people to express themselves and build up confidence. Make sure that they can choose to enter the circle or not depending on how they feel. However, you will find once a few have started the rest will follow.